Breast cancer is categorized into one of four stages. In stage one, either no tumor is found outside the breast or those tumor cells found outside the breast are very small. In stage 2, the cancer is either large or the cancer is small but spread to local lymph nodes. In stage 3, cancer has spread to multiple lymph nodes but not to distant organs. In stage four, cancer has spread to distant organs. To date (to the best of my knowledge), no group has done a randomized controlled trial of vitamin D supplementation and breast cancer survival due to ethical reasons. Most ethics committees would not allow identification and failure to treat (placebo group). Therefore, oncologists do not know if improving 25(OH)D status will improve survival. However, a group at the Catholic University of Korea has found that having or maintaining a 25(OH)D status above 20 ng/ml (50 nmol/l) improves survival from breast cancer. They are the first group to measure 25(OH)D over time (up to every year for four years) and investigate alterations in 25(OH)D status during the follow-up period as a prognostic predictor for breast cancer patients. Furthermore, they confirmed the association between the 25(OH)D status at diagnosis and breast cancer patient survival in detail by using stage and age-based stratifications. The researchers retrospectively reviewed the medical records of 491 Korean women with breast cancer diagnosed at St. Vincent hospital between January 2000 and December 2008, who also had a baseline 25(OH)D measured (before surgery) and at least one annual follow up 25(OH)D. They followed the women for four years, classifying the women as deficient (< 20 ng/ml; 50 nmol/l) or sufficient (> 20 ng/ml). The results for stage 3 patients were remarkable and shown in the survival graph below. 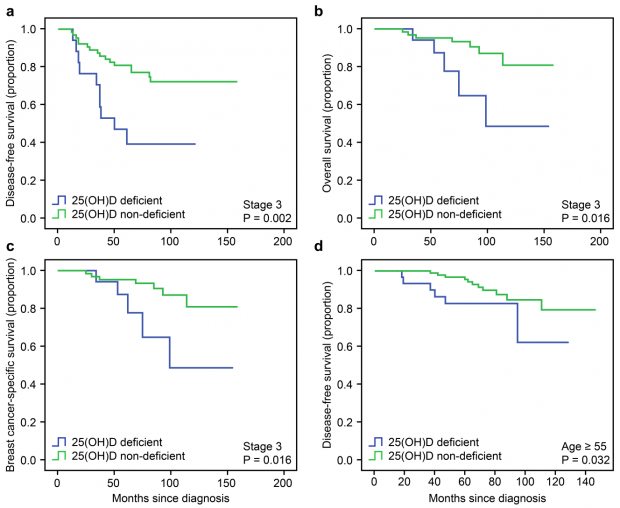 Association Between the 25(OH)D Status at Diagnosis and Survival After Stratification Based on the Stage and Patient Age. (a) disease-free survival in stage 3 patients; (b) overall survival in stage 3 patients; (c) breast cancer specific survival in stage 3 patients (d) disease free survival in patients older than 55. As the researchers had obtained more than one 25(OH)D level at least a year apart, they were able to see if the women with low baseline levels who were later found to have levels above 20 ng/ml (vitamin D improved group) had improved survival. In fact, the vitamin D improved group had the same improved survival rate as the women whose 25(OH)D status was always above 20 ng/ml. This survival was better than the women with perpetually low 25(OH)D, as well as the women whose 25(OH)D levels fell below 20 ng/ml over time (overall survival, P=.014). In this study, the researchers observed significant changes in vitamin D blood levels during the 4-year follow-up period and these levels were associated with survival. To our knowledge, this is the first study to investigate alterations in the 25(OH)D status during follow-up as a prognostic predictor for breast cancer patients. Furthermore, these authors confirmed the association between the 25(OH)D status at the time of diagnosis, as well as breast cancer patient survival by using stage and age-based stratifications. However, I have watched women die from breast cancer whose 25(OH)D level was 80 ng/ml (200 nmol/l). It is important to remember that this study only shows that risk of death is lower with higher 25(OH)D status, not that all deaths can be prevented by having a high 25(OH)D.
We recommend that breast cancer patients maintain their 25(OH)D level around 80 ng/ml, which is in the high normal (laboratory averages) and high natural (those who live in the sun) ranges. Furthermore, we recommend women obtain their vitamin D by short periods of full-body, noontime, sun-exposure during times when one’s shadow is shorter that they are tall. Brief exposure to UV radiation using old fashioned, low-pressure sunbeds can also be used for this purpose. If neither of those options are available, we recommend supplementing with anywhere from 5,000 to 20,000 IU/day, with the first 5,000 IU/day obtained by taking 3 capsules of D3Plus, in order to obtain a blood level around 80 ng/ml.